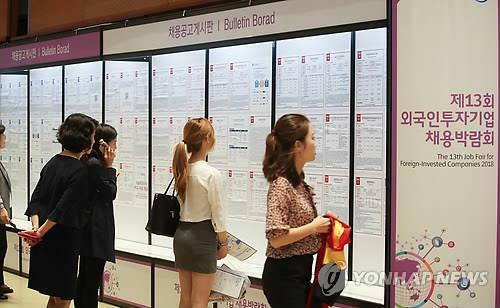 SEJONG, Oct. 12 (Yonhap) — South Korea’s jobless rate rose slightly in September due to a fall in employment in the retail and restaurant sectors, with poorer-than-expected job creation showing no signs of a letup, government data showed Friday. The unemployment rate stood at 3.6 percent last month, up 0.3 percentage point from a year earlier, according to the report compiled by Statistics Korea. The number of employed people reached 27.05 million in September, up 45,000 from the same month in 2017, according to the data. The unemployment rate for young adults — those aged between 15 and 29 — was 8.8 percent, down 0.4 percentage point from the previous year. The employment rate stood at 66.8 percent in September, down 0.1 percentage point from a year earlier, with the corresponding figure for young people at 42.9 percent, up 0.7 percentage point over the cited period.